Last week I was lucky enough to be invited along to the press night performance of Philip Pullman’s I Was A Rat! at the Nottingham Playhouse. Suitable for children over 7 I took my eldest daughter, Miss E along with me too; a fabulous adventure for both of us. Now I’m no expert at reviewing theatre so I’m going to tell you what we saw and how it made us feel and hopefully convey this effectively. I Was A Rat! tells the story of a rat-boy, Roger, who turns up at the home of Joan and Bob one rainy evening, claiming ‘I was a rat’ over and over and not appearing to have the manners or social skills a boy of his age should have. Not knowing anything about himself or his family, Joan and Bob attempt to help the boy, taking him to City Hall, the Police Station and the Hospital but no-one knows who he is or where he is from. The set is minimal, with the focus on incredible costumes and actors playing multiple parts. Clever lighting creates the boundaries of the set and pulls the focus from one character to another. When Roger is taken to the Philosopher Royal and declared that he probably was a rat, he escapes and is taken into a circus show as the main attraction. It was here that we really started to feel Roger’s desperation and loneliness. As a parent, this pulled at heartstrings; a child without family, without love and care being exploited by villainous characters, lost and alone. The young actor, Fox Jackson-Keen was totally believable as Roger the rat-boy and Miss E was transfixed by his acrobatic dancing and sweet, adorable character. Roger’s relationship with Joan and Bob, and his willingness to learn from and please them was delightful to watch. 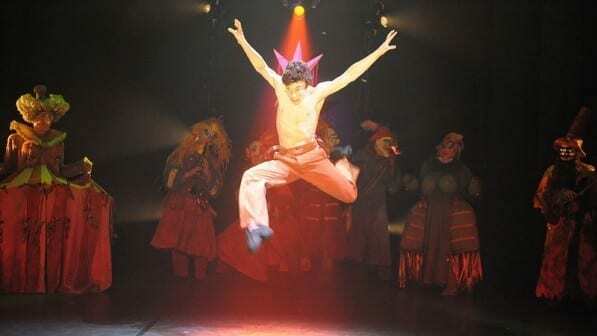 Miss E loved the fact that Fox, had starred as Billy Elliot a few years ago and delighted in his gymnastic abilities! The circus freak show is cleverly done, encouraging audience participation which of course, appeals to the children, with fabulous costumes, singing and dancing. I was concerned at this point, that Miss E would find it all too sinister. The characters and costumes, particularly the face masks are very well done, and quite menacing. It reminded me of Clockwork Orange, or the film adaptation of Moulin Rouge. Would this all be too much for the children? Miss E is almost 9 and in fact, was fine with it all but I wonder how younger children might cope with some of it. To be honest, I think much of it went over her head and it was the fairytale story extension that appealed to her. Earlier in the story, when Roger has seen a photo of Princess Aurelia in the newspaper, the Daily Scourge, he refers to her as ‘Mary-Jane’. When Joan and Bob are desperately searching for him after her disappears even from the circus, they decide to visit the palace. Bob has made a treasured pair of scarlet slippers and they take them along as a gift for the Princess. The ‘Princess’ isn’t played by any actor, but created from a set of body parts, puppet like, and brought to life by other actors’ hands. Couple this with the lighting and she seemed almost magical, like an angel. Princess Aurelia, or Mary-Jane as she was called just a few weeks earlier, remembers Roger the rat-boy, and tells the tale of being visited by a Fairy Godmother and she, a kitchen maid was granted her wish of going to the Ball, with a carriage and footmen. The link to Cinderella was subtle and fitting, and Miss E picked up on it straight away. Probably earlier than I did! It was over too soon. Miss E had a wonderful time, and it was lovely to introduce her to contemporary, very creative theatre. She has visited Nottingham Playhouse several times with school to their annual Pantomime visit and was extremely excited to have an evening out there again to see something different. It’s made me realise that she’s old enough to see and appreciate more complex performances and we should make more effort to visit shows like this one more often. 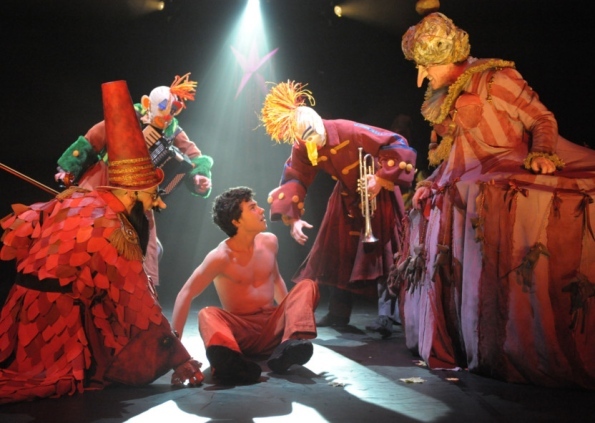 I Was A Rat is on at Nottingham Playhouse until 13th April after which it goes on a UK Tour. For more information or to book tickets go to the Nottingham Playhouse website. If you would like to see other reviews from other Nottingham bloggers then do click on the links below. Thank you to the Nottingham Playhouse for complimentary tickets to this performance. The comments and opinions and genuine, honest and my own. Next Post Why Choose Chrome Accessories for your Bathroom? A great review with a Jen focus on costume and lighting! Love it! Great review Jen. Yes, as Becky says, I thought you might focus on those elements – can tell you know all about design. Wasn’t it lovley to get so many bloggers and children together!